December 1st is here again and I present you with a giant complex firework of a snowflake to kick off the new season! Let’s dive into the details, shall we? This snowflakes was photographed last year, but due to my assumptions of a complex and lengthy edit, I never got to it. It was nestled quite closely into the fibers of the black mitten I use to shoot my snowflakes on, meaning that fibers from the mitten were showing up in nearly all of the little openings between the branches. I worked on this crystal to clean up the background over three days, spending about 9 hours on it to create the photograph you see here. This snowflake has already started to sublimate (evaporate from a solid without first becoming a liquid). It’s a process that begins as soon as the snowflake leaves the cloud that formed it as it enters a less humid environment, and by the time a snowflake hits the ground it has already started to fade away. For the most part, I only shoot snowflakes as soon as they fall onto the mitten. Within a few minutes, all of the images required for focus stacking have been captured and I move on to the next. This was different. The snow was so magnificent but only for a very brief period of time, maybe 15 minutes, but I still wanted to keep shooting. This image is the result of “dumpster diving” for snowflakes; if I take a cleaned-off woolen mitten and gently rest it on the surface of the freshly fallen snow, the fibers act as a Velcro-like fabric and many of the most recently fallen crystals will be lifted away from the white and I can see with contrast where an interesting snowflake might be. This one was taken about 15-20 minutes after it had fallen. All of the outer tips are rounded, where they would have originally formed into sharper 60-degree angles. I suspect this snowflake may have originally had a 5% bigger footprint with more pristine details around the outer edges… but it was still beautiful enough to photograph! 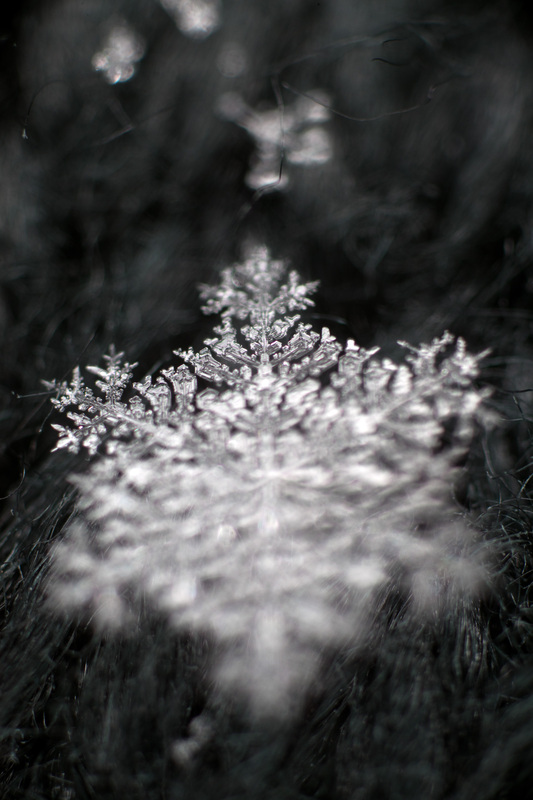 There’s other fun with a snowflake such as this – look at the lower right branch. You’ll notice that some of its side-branches are growing underneath the side-branches of its lower neighbour, but above those from its upper neighbour. Close examination of the center reveals that the bottom branch is ground one plane above the bottom left and right branches, and the top three branches are growing one plane lower still. Snowflakes are more multi-dimensional than we give them credit for! This adds to the complexity of the design, but it still somehow feels completely in balance with itself. Wow, I didn't know you were such an accomplished author/photographer until I spent so much time exploring your site and reading your blog. I have a 24x36 snowflake poster in my shopping cart and can't wait to get it. We have a few science-oriented girls who are going to be thrilled. I'll buy the book too. @Chris thanks very much for the compliments, it'll be great to get the post and book to you and your girls!